Jebel al-Buhais lies within the central sector of the Emirate of Sharjah. Rising to about 340 m above sea level, the Jebel consists of Maastrichtian limestone layers which date back to sixty or sixty-five million years. A series of intensive archaeological campaigns have recently taken place along the slopes and surrounding areas of the Jebel. These excavations have resulted in the discovery of a massive grave yard which contains numerous graves belonging to the Stone Age, Bronze Age, Iron Age and Hellenistic period. The Stone Age burial ground and settlement (Tomb BHS 18) dates to the beginning of the 5th millennium BCE. The Bronze Age is represented by numerous tombs dating not only to the first half of the 3rd millennium BCE but also to the Wadi Suq period of the 2nd millennium BCE. The examples of Wadi Suq funerary architecture uncovered were notably diverse and included both over-ground, monumental style tombs and subterranean tombs. Tomb BHS 66 is a unique and unprecedented example of subterranean funerary architecture with a clover shaped layout consisting of four richly furnished burial chambers. The tomb had been used for collective burials with men, women and children buried together. Many human remains were thus housed alongside a wide variety of funerary offerings. Tombs BHS 8 and BHS 12 are other subterranean examples which yielded distinctive materials from the Wadi Suq period. These items included painted pottery, chlorite vessels, weaponry and personal adornments. A number of tombs belonging to the Iron Age (1st millennium BCE) were also found. 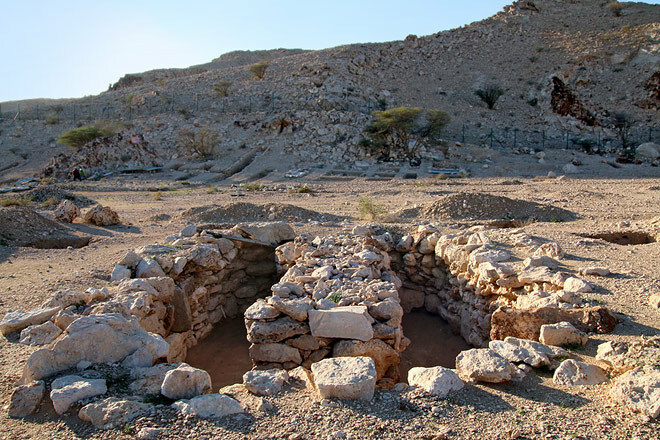 These consisted mainly of simple cist graves however the naturally occurring rock shelters of the Jebel had also been used to inter the dead and a number of Bronze Age tombs were found to have been reused for burial purposes. The rock shelters in particular contained a variety of Iron Age materials. Despite the abundance of materials uncovered at the site, only a few graves contained items from the Hellenistic period. The Hellenistic materials found consisted mainly of glass vessels. The Necropolis of Jebel al-Buhais. Prehistoric Discoveries in the Emirate of Sharjah, United Arab Emirates.